7th grade band students at Mitchell meet every day in the band room as a full band. I begin the school year reviewing all of the concepts from 6th grade such as: posture, breathing, starting and ending notes, tone production, correct hand placement, correct mouth placement (embouchure), and basic music theory (note names, note values, musical terms, articulation, dynamics, etc.). Percussion students will continue the process of learning how to play the many different percussion instruments (with correct technique!) which include: bass drum, cymbals, suspended cymbals, xylophone, timpani, snare drum, drum set, gong, concert toms, congas, crash cymbals, tambourine, and many others. By the end of 7th grade I also require my percussion students to learn an additional way to hold their drumsticks called, "traditional grip". My main goals for this school year will be to reinforce and maintain proper playing techniques as well as to continue and develop a sense of performance, musicality, energy and teamwork as part of the Mitchell band program. 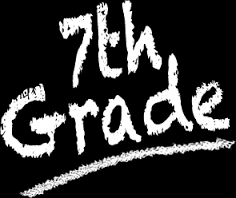 The 7th graders will meet as a combined band with the 8th graders at least twice before each of our two band concerts. 7th graders are eligible to try out for the Mitchell Symphony Band (made up of a combination of 7th and 8th grade students - rehearsals usually begin in late September with a trip to a national music festival in the Spring) They will again be eligible to march in the Junior Lighthouse Brigade (rehearsals will begin in March or April).